“That was easy.” It is a silly thing to post, but it amused me while i was in Staples waiting in line with a friend. And i’ve always had this soft spot for big red buttons… (long story short, some day my car will have a flip panel red eject button. many ideas what i may do, or not do)… and that human nature iressistability to pushing it. What is that all about? So here is the Staples $4.99 “EASY button” about 4” in diameter and made in plastic, another bizarre manifestation of a marketing ploy for the xmas season… see the fun commercials too. B/c somedays you just need an easy button. UPDATE! I actually got hands on with an EASY button, FACIL button, and Yahoo! INSTA-YODEL button… videos, pics, etc. You have to love it ! I’m going out and buy a few. I’ve been looking for a lower price alternative to the big price, big button solutions that are available for those with poor motor skills. i was thinking of making it the GFY button, so when compusa or dell try to pass a lowball job offer i (and 10,000 other tech’s) have a response! www.impulsedesign.com/easy_button.pdf Also, check out the end result. Please spread the info and files to as many people as you can. Where to put the 9V battery? The volume on the RS recorder is very low - I like the load “That was Easy” and was hoping to achieve something similar. If someone knows how to tweak it, let me know. Where to put the record button. I snaked mine through the slot for the battery cover and have it glued to the bottom of the button. I’ve done it. My easy button now can record through the speaker and has an audio input jack. Currently it’s saying, ” But I don’t like Spam”. The article on how I did it will be in the hands of 2600 magazine shortly. btw, mine now reads Evil instead of easy. 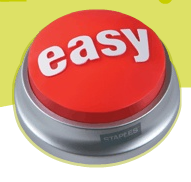 I LOVE my easy button. I decided the other day that I should try to ‘hack’ it. I took it apart, saw the complex simplicity of the pc board, and added a little red LED under the button. The power to the LED is through the speaker leads. It’s a pretty cool effect, the whole button lights up and bounces to the sound of that guy’s voice. Any luck recording on the easy button? Has anyone found a site with instructions on how to modify the voice or what it says? I have been searching and found nothing. The closest I could find, was to remove the button cover, then put in a picture frame voice thing to make the statment. Hacking the Easy Button hehe… I’m glad I’m not the only nerd in the world who wants to do this. The answer is “easy”, but will cost about $20 at Radio Shack. Last time I checked, they have a re-recordable chip similar to this, but with a second button to record. It’s small enough to replace the pc board in this. If you replace the metal “clicker” in the Easy Button, it would fit right below. You could use the current clear rubber button contact, so the button would still work consistently. You’d just lose that “click click” sound that I love. Hacking the STAPLES EASY BUTTON, DOES ANYBODY HAD ANY LUCK IN HACKING THE EASY BUTTON..
Hey, I took this thing apart. Seems there is a microchip that controls the voice. Any way of replacing it or re-recording the darn thing so I can make it say, that was stupid? Anyone know how to hack this thing? I’d really like to be able to make it say something else. Cheers!